Everybody knows what a dragon is: an enormous, fierce, bloodthirsty creature appearing in fairy tales and legends as an accessory whose main function is to set off the bravery of knight challenging him. The dragon is an obscure, mysterious character, described in broad terms, and is little more than foil to enhance the hero's valor. However the dragon is something else. He is admirable, intelligent and educated creature, who leads a most interesting life. He has some fascinating characteristics in addition to those occasional glimpses we are given through fairy tail and legends. In the world of fantastic animals, the dragon is unique. No other creature has appeared in such a rich variety of forms. It is as though there was once a whole family of different dragon species that really existed, before they mysteriously became extinct. Indeed, as recently as the seventeenth century, scholars wrote of dragons as though they were scientific facts, their anatomy and natural history being recorded in painstaking detail. The naturalist Edward Topsell, for instance, writing in 1608, considered them to be reptilian and closely related to serpents: "There are divers sorts of dragons, distinguished partly by countries, partly by their quantity and magnitude, and partly by the different form of their external parts." Personifications of malevolence of beneficence, paganism or purity, death and devastation, life and fertility, good or evil. All these varied, contradictory concepts are embodied and embedded within that single magical word. The dragon has always been slandered and misjudged, persecuted and hounded by man, simply because they are different. Like so many other living beings, he has experienced death and persecution in the name of so-called superiority of civilized man. Perhaps, in the future, man will learn with the death of a single animal or plant species an irreplaceable asset - something more precious than all the wealth in the world - is lost. Only then will the Earth continue to be a brilliant blue jewel in the universe, for in its heart will be locked the priceless treasure of the diversity of the species, and man will have recognized his duty to cherish every single one. The dragon is a homoiothermic reptile. In other words, he is a warm-blooded creature and his body temperature is controlled internally. This characteristic enables him to adapt to the different climates of his very extensive habitat and to maintain his activities both day and night throughout the year, as he is not dependent on the warmth from the sun like the other reptiles. The dragon generally has wings, and his bones are hollow, for lightness. There are dragons, usually ancient survivor from the distant past, with stumpy legs and no wings. These rare survivors of a remote era are intelligent and fairly aggressive, and belong to a single species known as "worm of the deep", a species on the verge of extinction. This creature lives for a very long time. 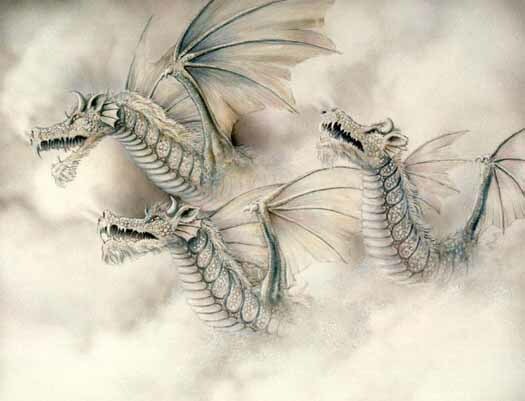 There are records of dragons who have lived for five hundred and even a thousand years, but there are no knows cases of dragons who have died from old age. On the other hand, they died from accidents, certain diseases, or as a result of the actions of their most relentless enemy: MAN.